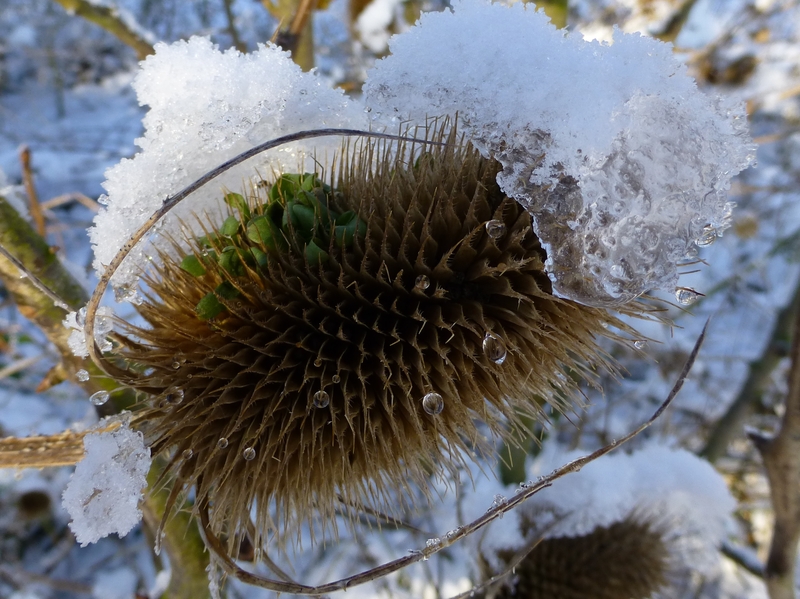 So here are some wintery photos taken during January and February. 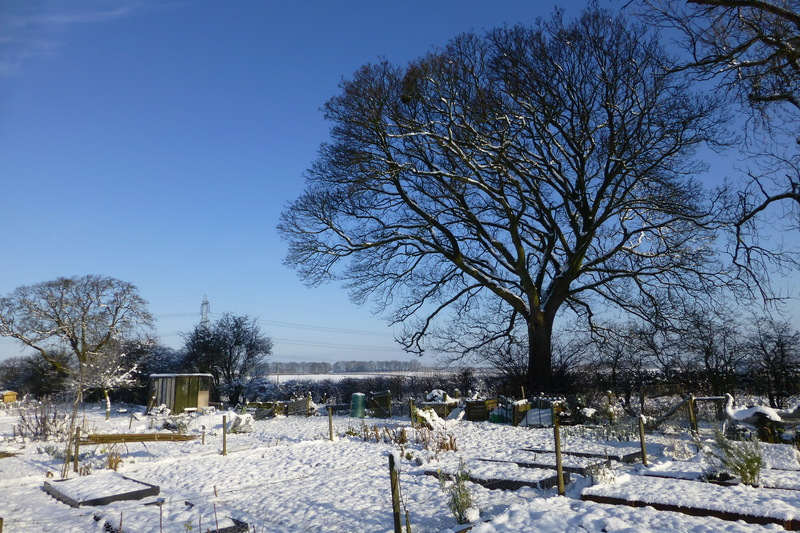 The allotment is still beautiful. On Saturday the weather was almost spring-like, and the committee worked together to clear out an old shed that was home to years and years worth of accumulated junk. It was the first time the new committee has worked on a project, and it was really rather enjoyable – good company, hard workers and plenty of laughter. Someone even brought the picnic basket. 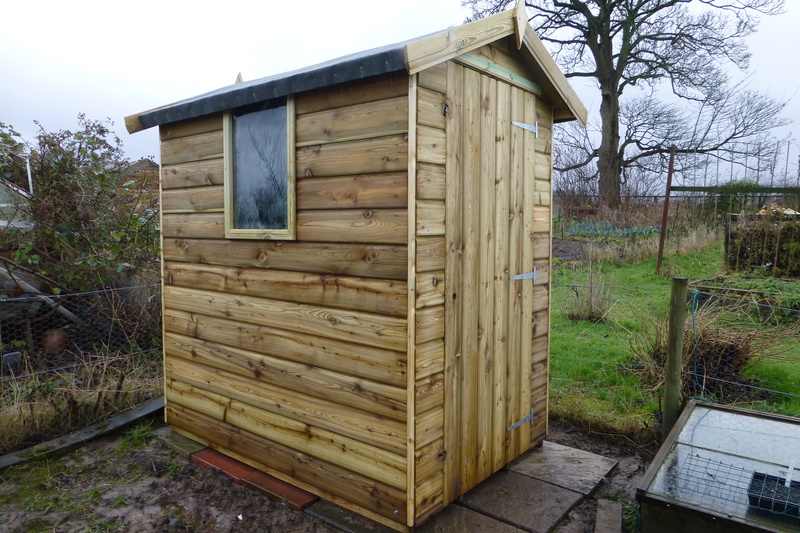 I’m very sad that I forgot my camera to record the before and after, but I’ll take a photo of the newly cleaned shed as witness to the event. So here’s what Santa brought me. 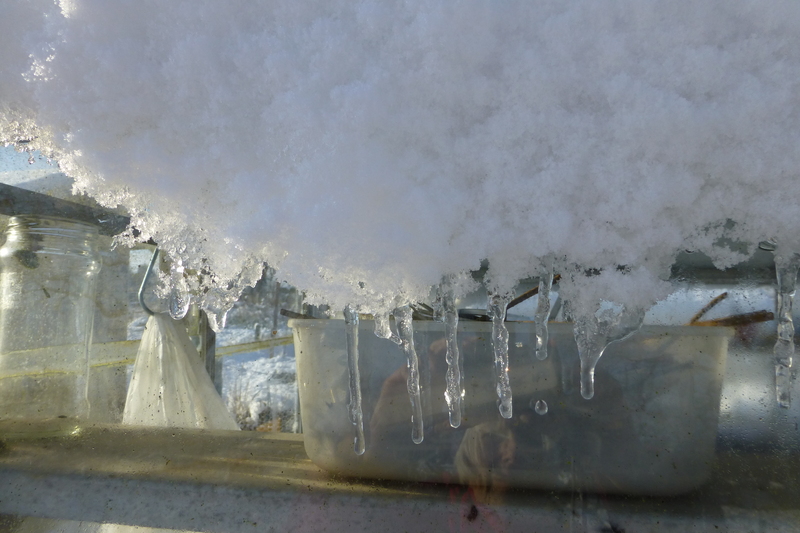 I intend to store my stuff and keep the greenhouse for plants, and I’m considering setting up a wee stove – tea and bacon butties sound good to me. 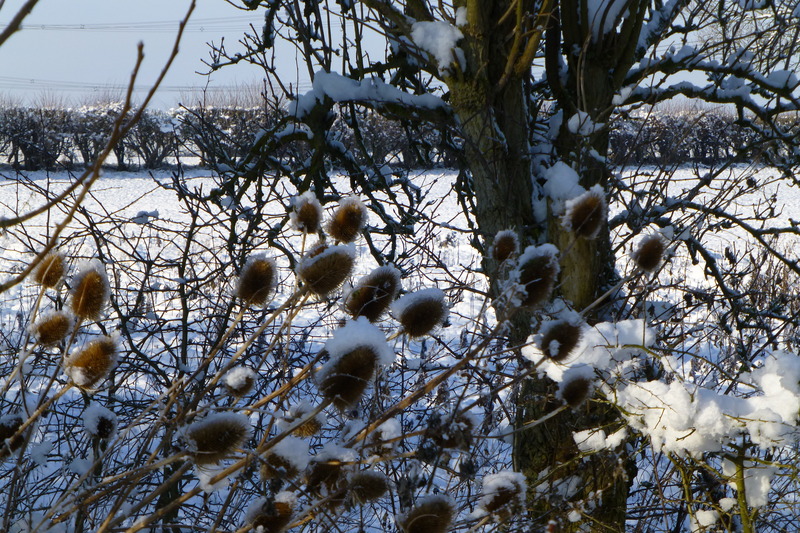 Come on Spring – where are you? Santa! And here he is, or it might be one of his little helpers. 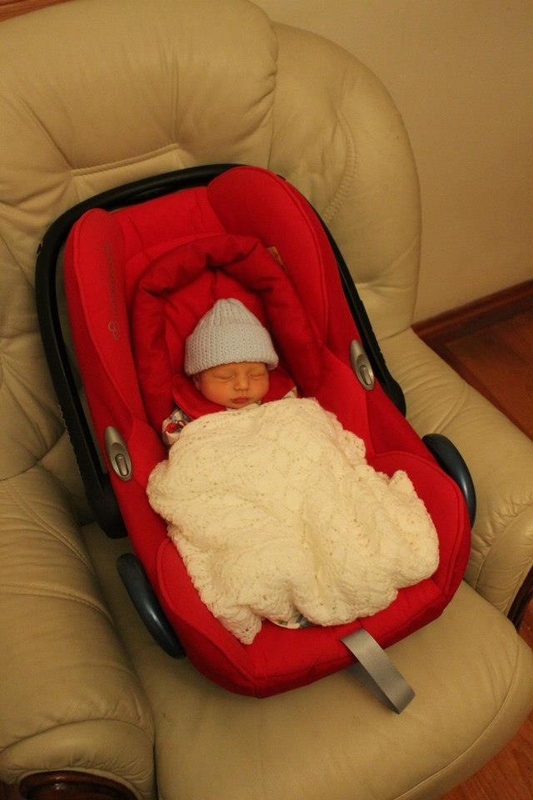 I’m afraid this post is sheer self-indulgence – I could look at my wee grandson forever. I’m sure it can’t be 4 months since I posted, but it seems so. No apologies because I’m sure no-one cares, but I’ve not been idle on the knitting front. Our beautiful wee grandson arrived early in September and we are thrilled to bits! 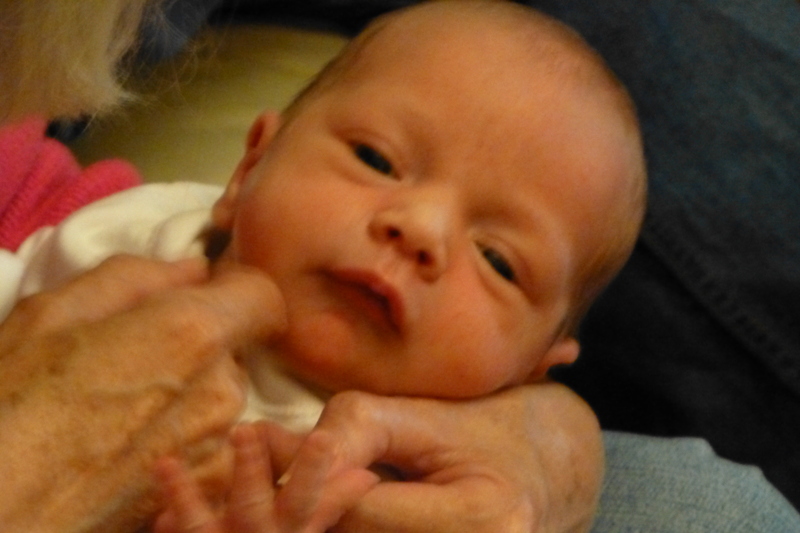 Here he is, baby Robert Isaac getting his first Grandma Snuggle – isn’t he just adorable! He arrived home from hospital wrapped in the shawl I knitted to bring his mummy home, 28 years ago – see, keep a thing long enough! 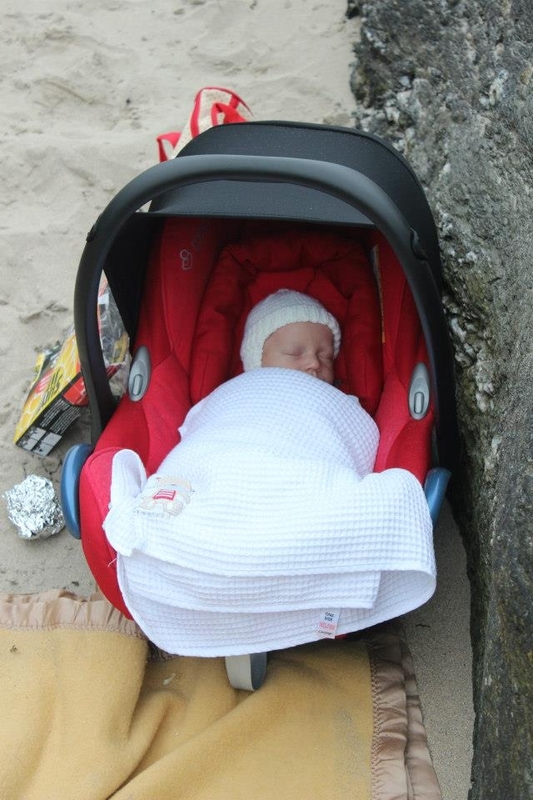 Here he is enjoying a beach picnic. Just the thing for a wee man who’s 4 weeks old. I was really pleased I’d achieved a hat that fitted – the one in the photo above was tiny, I thought, but has the look of being borrowed from his Dad! I’ll stop now though I could go on forever. Most of my posts seem to be of the allotment variety and Pinkshoesknits has become something of a misnomer. To avoid being accused of misrepresentation, here’s one I made earlier. A lot earlier. In fact, it’s close to two years since I started Louisa Harding’s Anouk. It wasn’t the difficulty of the pattern that kept it from being finished, rather the lack of appropriate weather. We still don’t have appropriate weather but I needed a finished object for the Month of June on Phoenix Knits and when I pulled this one out I remembered why I’d fallen in love with it. There are two versions, this one is the shorter and on me it sits nicely a few inches above my waist. This might not suit the needs of the longer bodied but it’s just right for me. Model Agnes, although broader of beam, is slimmer of waist than I (isn’t everyone) so it appears less fitted than it really is. I have to say it has restored my faith that I can actually produce something I like, and equally important, actually fits me! The buttons are not entirely to my liking and had to be sheared from a charity shop blouse size 22 (I am size 6) which is a shame because a larger lady might have liked the blouse. Until I find the perfect little pearly jobs these will have to do. Oh and for those who like to know these things, the pattern calls for 6 balls of Louisa Harding Merletto which I didn’t have. I did have 6 balls of Louisa Harding Kashmir which I bought for the grand total of £6. It took all but a tiny amount (less than 10g). The 2 lots of buttons I’ve experimented with so far have cost me more than that! On the subject of the allotment, I have nothing good to report. If you were interested in slugs, mice, beetles, caterpillars, thieving blackbirds, driving rain, galeforce winds and cold that woud skin you I could tell you plenty. Meantime, hoping for better weather … I could just knit. The lovely Squirrel at http://squirrelsknittingconquests.blogspot.co.uk/ has nominated me for a Versatile Blogger Award. Thank you so much Squirrel, I feel honoured. The rules of the game oblige me to nominate some other blogs I visit or have recently discovered, so a list will be appearing soon and the awards will wing their way in the fullness of time. Another requirement is that I share 7 things about me. Well now, let’s see. No point in mentioning knitting, sewing or allotmenting because we know all that already. OK here we go. 1. I think … the internet is fabulous. I love google, I love snooping around in other people’s business reading other people’s blogs, I love the mindblowing amount of information that can be accessed at the touch of a button. If my great-great-grandfather knew I’d find a copy of his death certificate from 1865 when he took a knife to his throat, he may well have thrown in the towel. (I am seriously into family history). 4. I dream … of going back to live in Scotland where I was born and brought up. Not all the time, just occasionally. 5. I would probably … never eat a square meal again if my husband didn’t cook for me. Not that I don’t like food, just too idle busy to spend time feeding myself. 6. As a consequence of (5) above … I eat quite a lot of Chocolate Digestive Biscuits. 7. Despite (6) above … I weigh in at under 7 stones. Just in case you wondered. Thank you again Squirrel, but just look what you made me confess! And not without justification. You’ve shared my space, taken my warmth and eaten my food. Now it’s over. Though I admire your determination, scrambling under the propagator lid and gnawing through the net curtain to savage my baby sweet peas. So I’ve left you a parting gift – look to the right as you head for dinner but go straight to pudding … the Mars Bar on the little prong is just for you. As a good friend once said to me – when it’s your time, it’s your time. 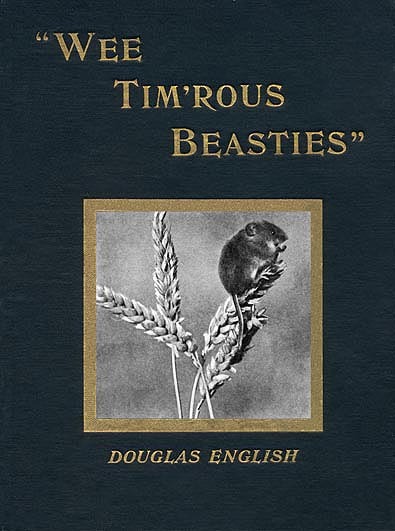 Yours reluctantly and with apologies to Rabbie Burns who was distraught upon disturbing a mouse’s-house. Bet he never tried to grow sweetpeas. If this goes according to plan, I’ll achieve a January post before it’s too late. Notoriously a dreary month, nevertheless it’s been a busy one with a big birthday (DH), a visit from a very dear family member (BiL) who we don’t see nearly often enough, some excellent meals out and precious Wednesday evenings with great pals (M&M). The allotment is resting, apart from the relentless tulips which made their debut appearance in December – I can’t believe it. They may be in for a shock if the “Siberian Beast” strikes as predicted and temperatures plummet. I can hardly wait – not. I sowed sweetpeas on 4 January and almost all in the first two trays have germinated. The others will appear next week as they were started later. 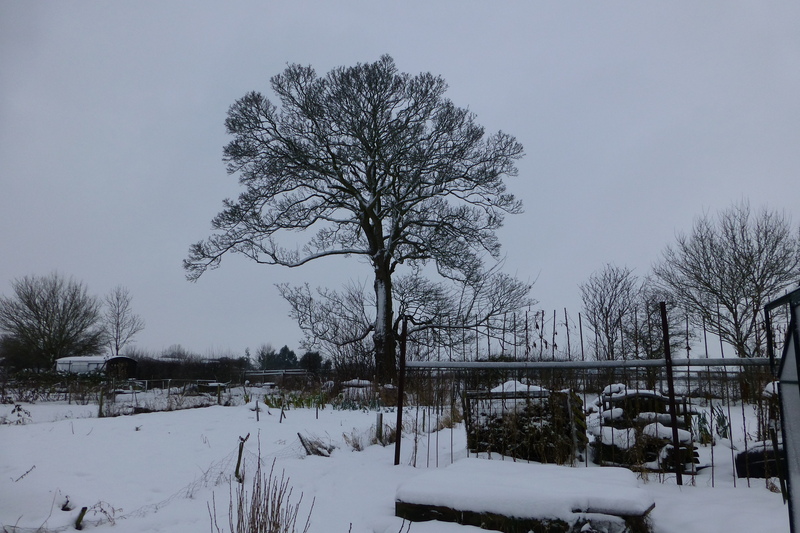 And today the rhubarb forcer was positioned. I can’t wait for those lovely sweet juicy sticks and looking back to this makes my mouth water. We went out last night and had a beautiful meal, rounded off with “New Season Rhubarb Crumble”. I swear I could have eaten a bucketful. Served with the most delicious custard. The man can cook! On Phoenix Knitting I’ve joined in the “project a month” which forced me to finish and photograph these. 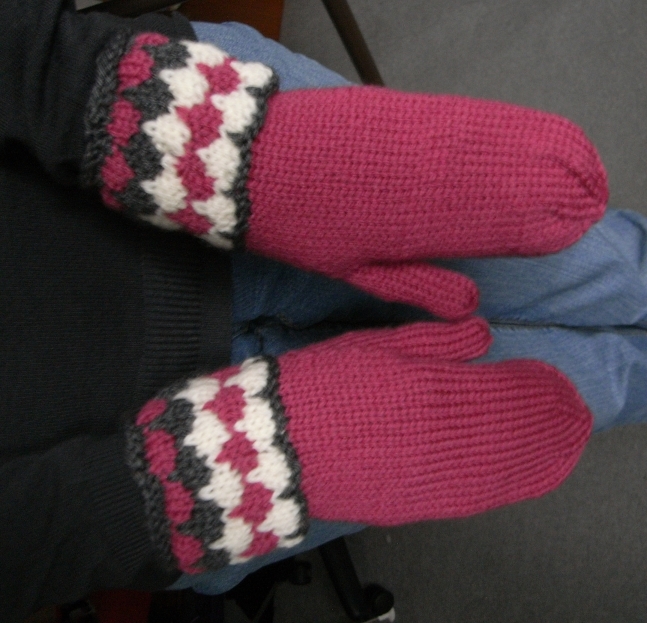 The mittens are Cloisonee by the Yarn Harlot. Such an easy knit, but I think very effective. My hands are really small and the Aran weight called for in the pattern wasn’t going to work. 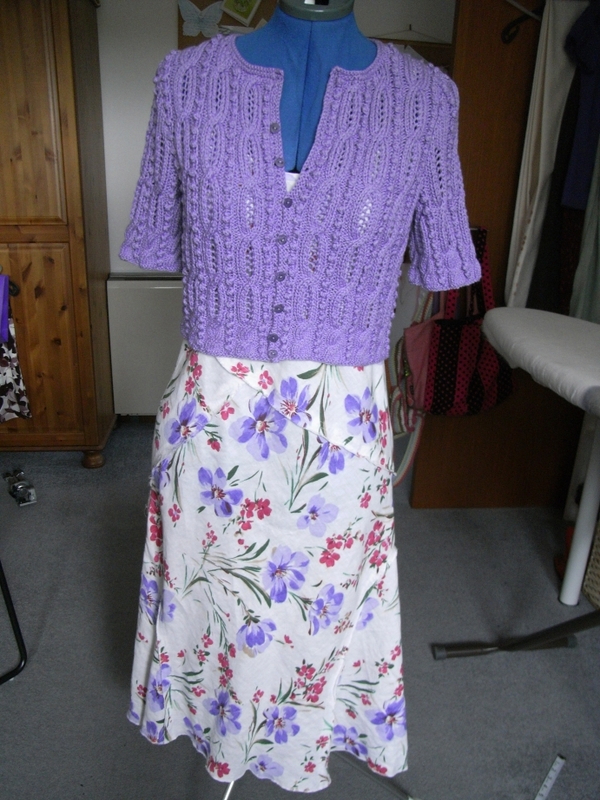 I used DK and 4.5mm needles and just knit exactly to pattern. Perfect fit for me. The scarf should be a cowl, and will become such if I can find a yard or so of that yarn. This will be the proverbial needle in haystack. 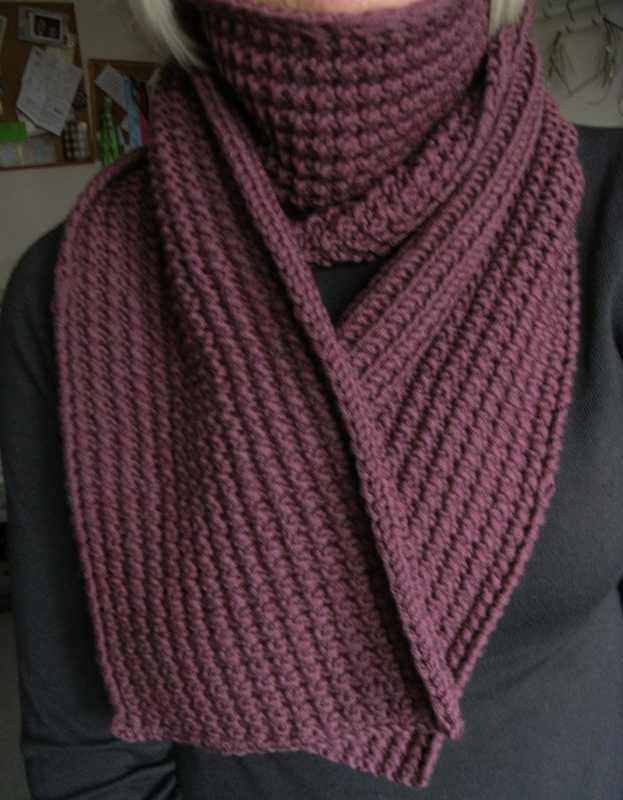 It’s still a pretty good scarf though, but I’ll be really pleased if I can stitch it up. I’ve started doing this with scarves, knitted or bought, and delight in the lack of flying tails. Very neat and tidy, they lie beautifully under a jacket and no worries about where to stuff the excess. Warmer too.